Patti had requested a consultation after hearing about the Transition Bay Permablitz. 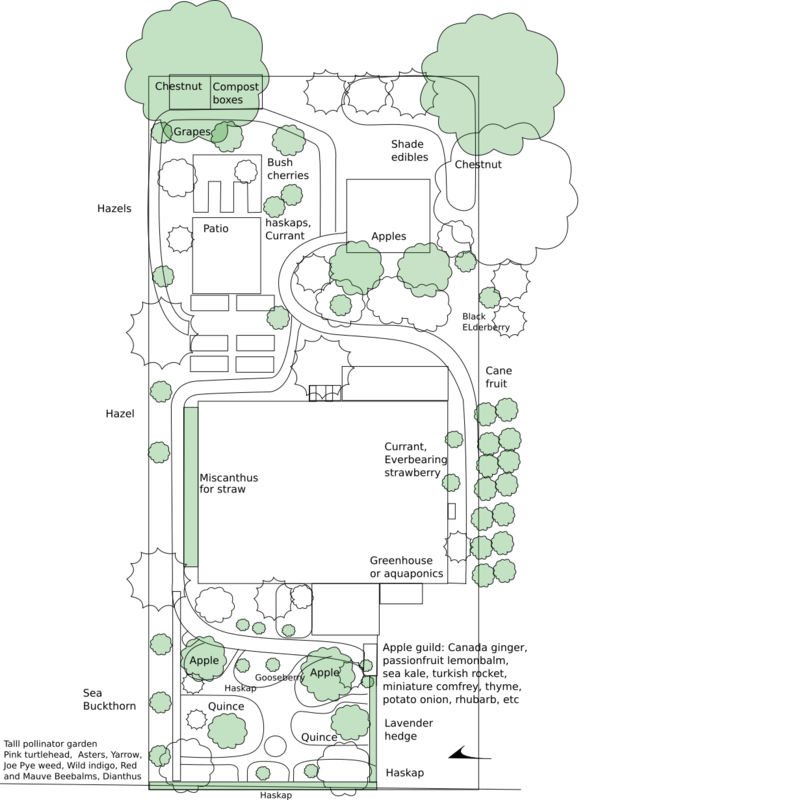 During 2017 we cleared overgrowth, established paths and canopy trees, and some understory, as well as restoring pavers and brick work. The land had had extensive gardens from the previous owner and had been fallowed for ten years and was now a thicket with pioneer and introduced trees and shrubs as well as herbaceous perennial forbs. Though mature and largely self-managing, the previous garden was ornamental and not productive, and some shrubs were planted too close together for their mature sizes. 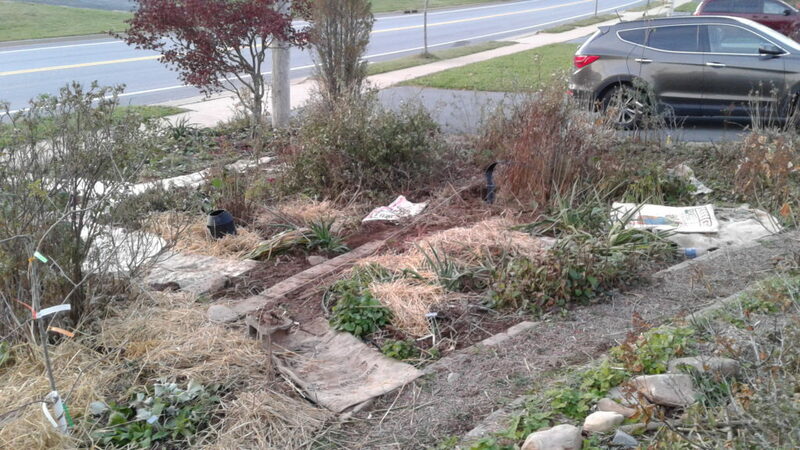 The client wanted an edible landscape and all remaining grass removed and replaced with productive groundcover. We removed all established and seedling dog rose, virginia creeper, coltsfoot, bittersweet nightshade, wild raspberry, and some domestic roses. Spirea was considered too self-seeding and abundant and was also removed, to reduce deadheading labour. Elements from the old garden were kept such as dianthus, grape, cottoneaster, hardy fig, haskap, blueberry, quince, heather, and white pine. The untilled fallow period left the soil in excellent condition and caused some desirable species to seed in such as Saskatoon berry, wild strawberry, dewberry, and sweet bay. We also left some aster and goldenrod for pollinators. 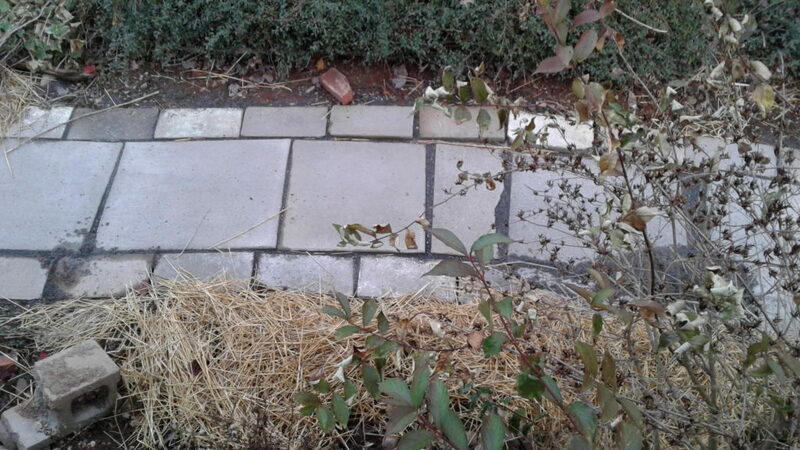 We removed brick-paved paths that required much weeding maintenance and replaced this with wood chips. 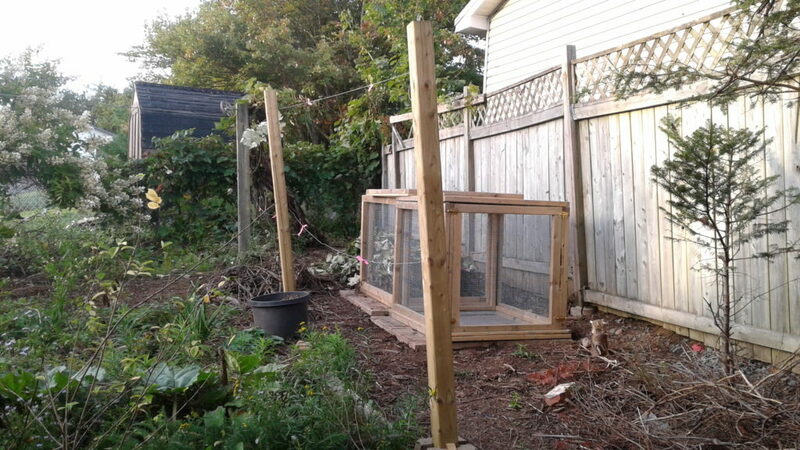 We removed the grape pergola and trained the grape to two wires and the wire fence. We added an air potato to the fence. We planted four apple trees, two chestnuts, four hazels, three sea buckthorn, domestic raspberries, and an understory of lavender, alpine and everbearing strawberry, Good King Henry, lovage, lemonbalm, spearmint, oregano, russian comfrey, bee balm, bunching topset scallions, fenugreek, kale, Anise hyssop, french sorrel, and Carpathian harebells.